There's nothing like a record-breaking snow storm doing cartwheels outside my window to send me on a downward spiral of looking at pictures from a warmer time; so thank you, Jonas, for bringing my attention back to this wonderful man. R.C. Bates caught my attention outside the Intelligentsia on Sunset a few months ago as he casually asked caffeinated passerby's if they liked poetry. It was a simple question, but simple enough for those in earshot to feel an internal wave of guilt if they chose to ignore it, especially in a neighborhood like Silverlake, where if you don't at least pretend to enjoy any and all forms of self-expression, no one would stop you from getting burned at the end of a organic, vegan stake. It was as if Gepetto wanted a wizard instead of a real boy and Bates was the result of his imagination. Everything about this man - his style, his attitude, his words - was straight out of a fairy tale. After handing me some booklets of his poetry, he, in the same nonchalant manner that attracted me to him in the first place, told me about some of the movies, bands, and music videos he had been a part of in his 'former lives'. One can only imagine how much trouble he found in those lives to come out on the other end feelin' himself like he does now. While I recognized as much from his bio as I did when my mother listed off her favorite contestants from The Voice, I still listened intently because something about Mr. Bates demands respect. 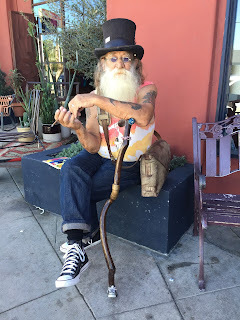 Whether it's his Merlin beard, his Hatter's hat, or the mini, matching Converse that fits perfectly on the cane he made himself, I will never know.